These surface yeasts metabolize ethyl acetate and acids into aldehydes while simultaneously protecting the wine from direct contact with air. This process produces a unique “sherried” character and conveys long ageing potential. By law, the wine cannot be bottled until 6 years and three months after the vintage (i.e. January, seven years after harvest). By law, it must be bottled in an unusual 620 ml bottle called a “clavelin.” During the ageing process, a significant volume of wine is lost through evaporation/transpiration. Reputedly, a liter of wine is whittled down to 620 ml by the time cellaring is complete, hence the bottle size. But storage conditions vary and the volume of wine lost during the ageing period is equally variable. This dry, nutty, white wine is typically not chilled before serving. Most are decanted for several hours and served at room temperature with a nice wedge of Comté cheese and a splash of walnuts. Chicken with morels in a vin jaune cream sauce is traditional dish incorporating the wine…which is also served alongside! 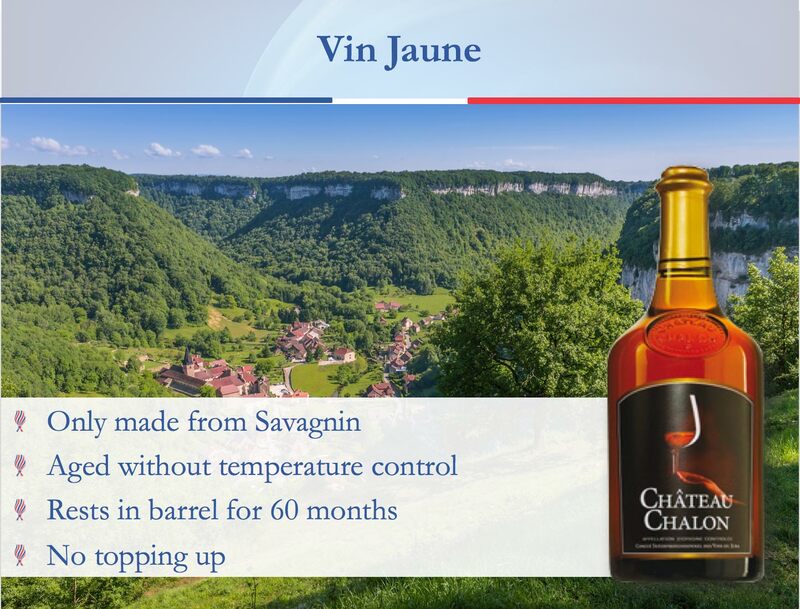 A typical vin jaune can last a decade or longer…although once you try one, no bottle will last so long on the shelf thereafter.